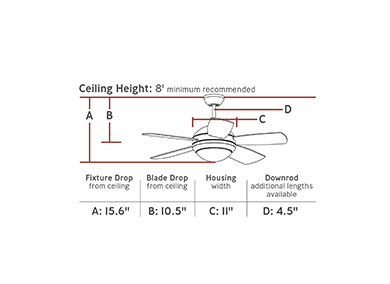 The Discus II ceiling fan is a 44” version of the popular original Discus 52” ceiling fan. With a minimalist, contemporary design and several color options, the Discus II fan can complement a wide variety of room styles. With an integrated halogen downlight, the Discus II fan has an optional remote control. Airflow is 4,262 CFM (cubic feet of air per minute). The fan’s blade sweep is 44”. Discus II fan comes with a three-speed pull chain. Triple capacitor, 3 speed reversible motor. Precision balanced motor and blades for wobble-free operation. 12 degree blade pitch designed for optimal air. Extra long 6.5 foot lead wire for use with long downrods.